Now that summer is in full swing, there’s no question that it’s iced coffee season. The only matter up for debate is whether you want your java strong and bracing or sweet and creamy. Luckily Rockefeller Center has plenty of choices for a caffeine fix—in fact, it's home to some of the best iced coffees in NYC. Oakland-based Blue Bottle is one of the notable third-wave coffee roasters credited with ushering in the cold brew boom. Beans are steeped 12 hours in room temperature water for a mellower, lower-acid result. Two varieties are available: the signature New Orleans-style brewed with roasted chicory for a slightly bitter kick that's softened with organic milk and cane sugar (also available in milk cartons for later), and a powerful black version for purists to doctor as they like. While the iconic skating rink is a winter-only affair, warm-weather visitors can take advantage of the open-air Summer Garden & Bar for a leisurely pick-me-up. The courtyard, featuring a cascading fountain (bathing Prometheus), loungy furniture and oversized umbrellas, is as close to beachy as you’ll get in this bustling section of Midtown. This isn’t the place for on-the-go office fuel—cold brew is only available for takeout at the indoor bar and after 10:30am. In a hurry? Try Cucina & Co. across the way, which serves the same organic joe. Bouchon Bakery’s lure might be the tidy rows of pastel macarons and meringue-topped tarts beckoning from the display case, but this outpost of chef Thomas Keller’s famed Napa bakery is also a source of his exclusive iced coffee, a custom house blend from Equator Coffees & Teas that’s smooth with a subtle chocolate undertone. Pair it with a pastry at an outdoor table or take it for the road. ‘Wichcraft applies the same ethos about quality ingredients to its coffee as it does to its sandwiches. 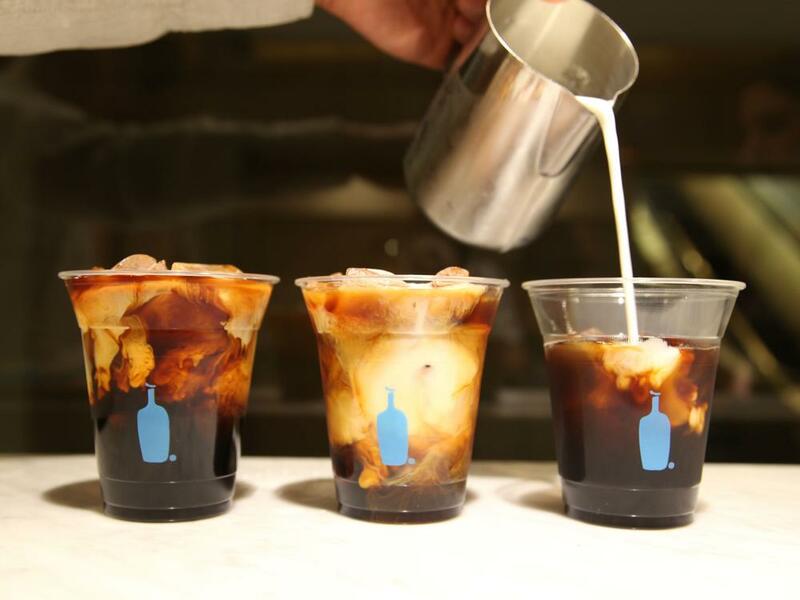 Iced coffees, lattes and cappuccinos are made with beans from craft roasters La Colombe, also providers to restaurants like Daniel and Le Bernardin. Sweet tooths have multiple options for double-duty indulgence. Those craving cupcakes minus the West Village original's long lines can stop by Magnolia Bakery and pair them with an iced vanilla or caramel latte using coffee from Peet’s Coffee & Tea. Dessert in a cup can be had at Jacques Torres, where the intense frozen hot chocolate can be jazzed up with a shot of espresso. Parisian confectioner La Maison du Chocolat also serves an iced cappuccino for a leisurely sip with your bonbons—or you can opt for a chocolate frappé whipped up with espresso ice cream. Offering choices like standard iced coffee, a newish cold brew, granitas and more, crowd-pleasing Starbucks has two locations in the Concourse. Au Bon Pain is an alternative in a similar quick-and-casual vein.